Since 1996 the Lombard Horticultural Society has been devolving profits from the flower show to green areas in the city. These initiatives are united under Green interventions for the city, regulated by the convention stipulated in 2014 with Milan Municipality. 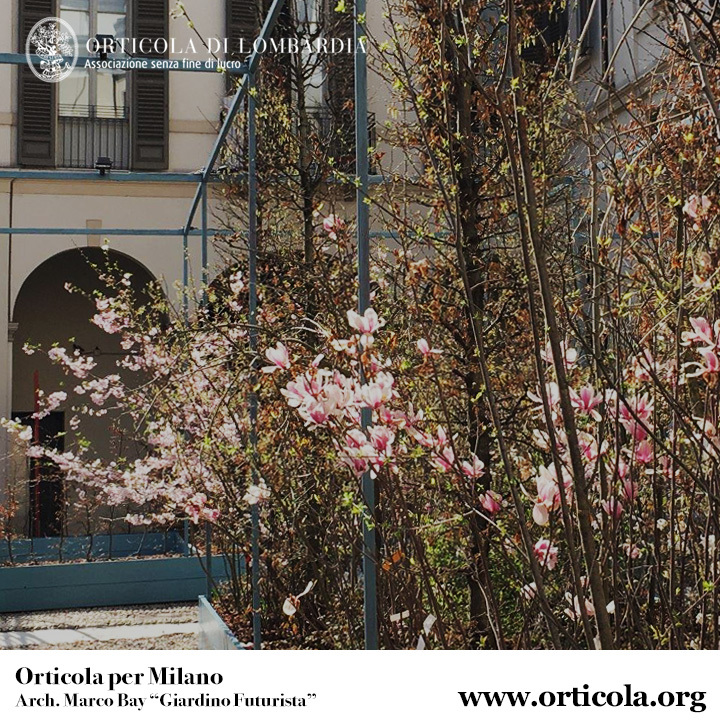 Orticola is responsible for embellishing the entrance courtyard to Milan’s Modern Art Gallery in via Palestro, supplying and maintaining the plants and pots, chosen to suit the architecture of the Royal Palace, the patterns in the cobble paving and the façades. The containers, made to measure, are reminiscent of the “Caisses de Versailles” and contain topiary yew pyramids alongside benches in early nineteenth century style, so that furnishings and topiary harmonise with the elegant neoclassical style of Villa Belgiojoso Bonaparte. The Milan Triennale has launched an improvement project for its garden which is not only a pleasant open space belonging to the Palazzo dell’Arte, but also home to works of great value such as the Bagni misteriosi by Giorgio de Chirico, amongst others. 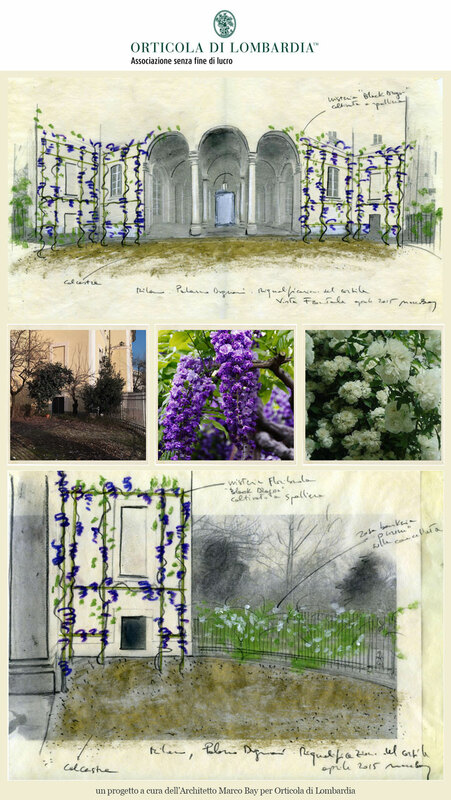 This gave rise to the idea of entrusting the Lombard Horticultural Society (Orticola) with an exploratory project of fresh planting by the landscape architect Filippo Pizzoni. The idea was to enhance the art works while emphasising the space and its particular amphitheatre shape. The project, with the assistance of Susanna Magistretti and Andrea D’Ascola from Cascina Bollate, the nursery run by Bollate Prison, together with the gardener Alberto Corti, foresees the planting of herbaceous perennials and grasses in the eight beds: acanthus (Acanthus mollis , A. spinosus), bergenia (Bergenia ‘Eric Smith’), sedge (Carex pendula) and feather reed-grass (Calamagrostis × acutiflora ‘Karl Foerster’). 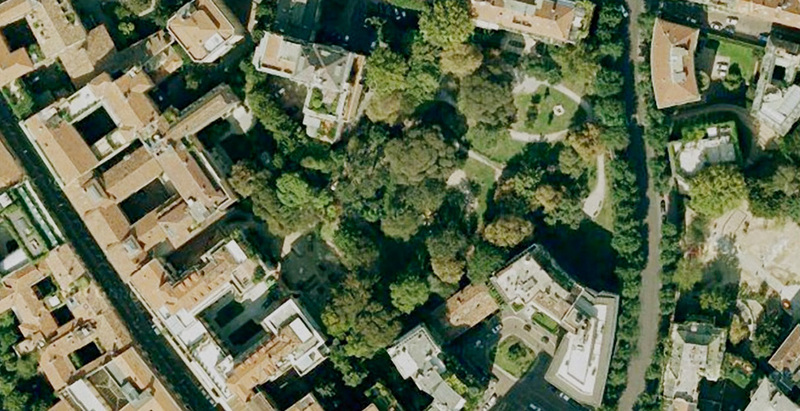 The smallest and most central romantic garden in Milan, the Perego Garden, is a true oasis of tranquillity and coolness, particularly on hot summer days. The Lombard Horticultural Society has once again taken on this beautiful park in Via dei Giardini, designed at the close of the eighteenth century for the Perego family from Cremnago, and will be responsible for the care and maintenance of the Perego Gardens for the next few years which were reorganised in the past by planting acidophilous species and providing irrigation. The garden was already restyled by Orticola in 2006, and for the following five years, with a futuristic playground in wood, to complete the restoration. 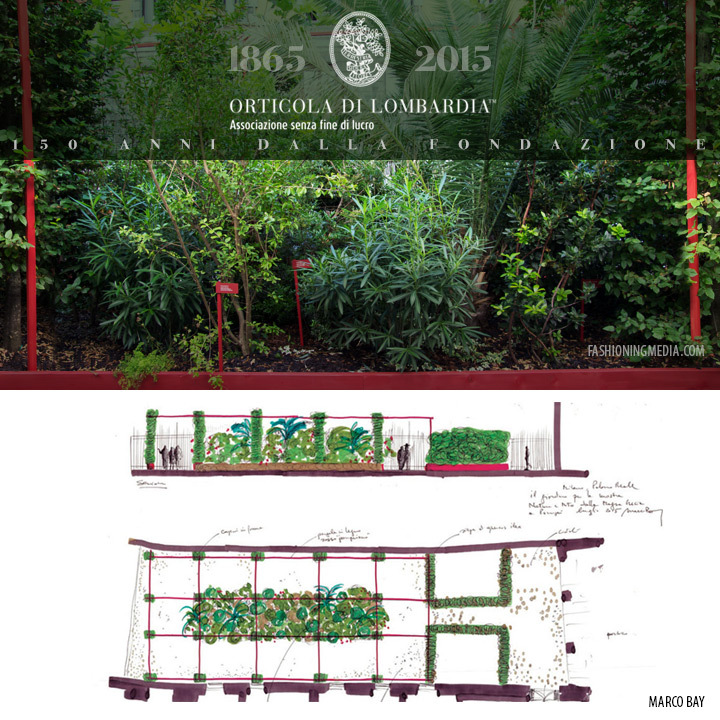 Since 2016 Orticola has reassumed its improvements in the Perego Garden in via dei Giardini. Besides the normal maintenance of mowing, leaf raking, irrigation and intervention after vandalism, unfortunately quite frequent, the practice of ordinary care continues, also involving new planting of tulips, scillas and crocus. A shade border has been designed under the beech trees, alongside the moss garden planted in one of the Perego beds, in an attempt to follow what nature suggests. Almost all the previous plants were lost, due to poor luminosity; different species of flora have been chosen from Italy and abroad, all already in cultivation when the garden came into being and able to survive in dry shade conditions, typical of many of the city’s gardens. 2018 sees the continuation of the initiative “Strolling in the historic garden”, a tour in the company of historians, experts and nurserymen, to relate the garden’s story, what is being done and the plants employed. 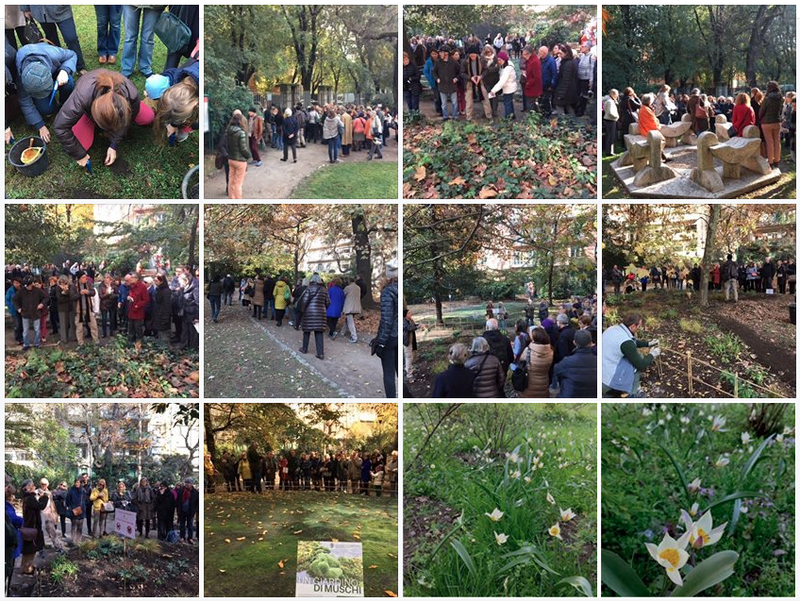 This appointment was highly successful in spring 2017, but even more so in autumn when we organised the “Bulb school” meetings together with the magazine IO donna on November 11th and “A stroll through the park” on Novemebr 18th, with the collaboration of Susanna Magistretti and other nurserymen. The tours will be repeated in summer and autumn. A pleasant pause in the heart of the city. The Royal Palace Garden was created by the Lombard Horticultural Society and inaugurated in 2017 as a gift to the population, a green space opening onto via Pecorari and furnished with benches, with scenic lighting in the evenings. It is now sought out by citizens and tourists looking for a congenial place to rest in the city centre. The project is by the landscape architect Marco Bay, inspired by the symmetric garden which once occupied the main courtyard, creating different environments. The main tree planting consists of Platanus orientalis pruned into “umbrellas”, forming a pergola. The skilfully mixed “undergrowth”, already experimented in Milanese gardens, guarantees year-round flowering: Myrtus communis ’Tarentina’, Rosa x odorata mutabilis, Anemone japonica, Helleborus hybridus ’Black night’, Begonia grandis var. evansiana. The Futurist Boccioni Garden project, inspired by the art of the Master, at the Royal Palace. The “green” partnership with french luxury brand Hermès continued with A futurist spring at Palazzo Reale, a garden designed by Marco Bay with the Nespoli nursery, in the open space behind the Royal Palace dedicated to the Umberto Boccioni exhibition, sponsored by Hermès in collaboration with IO Donna , the weekly Corriere della Sera magazine for women. A garden in the Royal Palace courtyard — A botanical project developed in the context of the major exhibition “MYTH AND NATURE. From Greece to Pompeii”, — nature, mythology and landscape in the ancient world” conceived by the Culture Department of Milan Municipality and the Royal Palace, from July 31th 2015 till January 10th 2016. 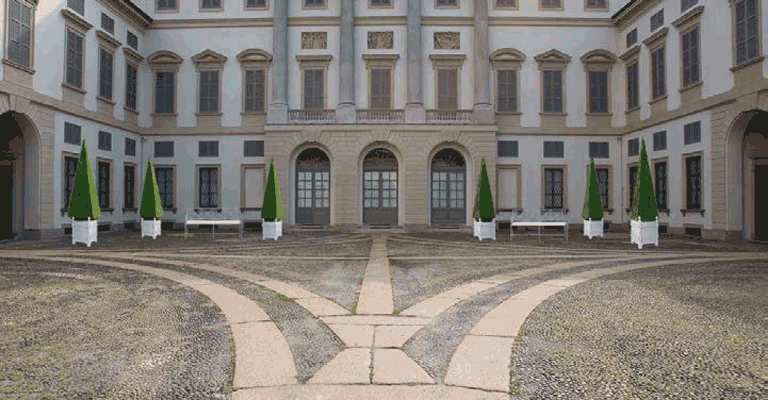 —, for the very first time a green itinerary conceived and presented by Orticola becomes part of an exhibition in the Royal Palace of Milan. A new, natural urban space, but fenced and with controlled access, for walking, learning, playing and chatting, for the use of the city with international scope, where distant colours and tastes reestablish contact between city and countryside. 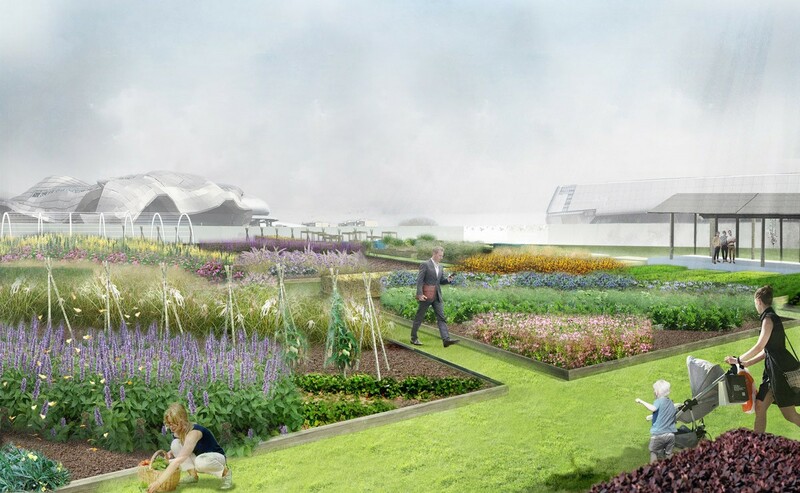 As part of the urban renewal project in the Milan Fair district, organised by CityLife, the Lombard Horticultural Society has created the “Flowering Allotments”, covering over 3,000 square metres. This is a garden-allotment for residents and citizens, uniting education and ornament, offering pleasant strolls beneath the skyscrapers from spring till autumn. 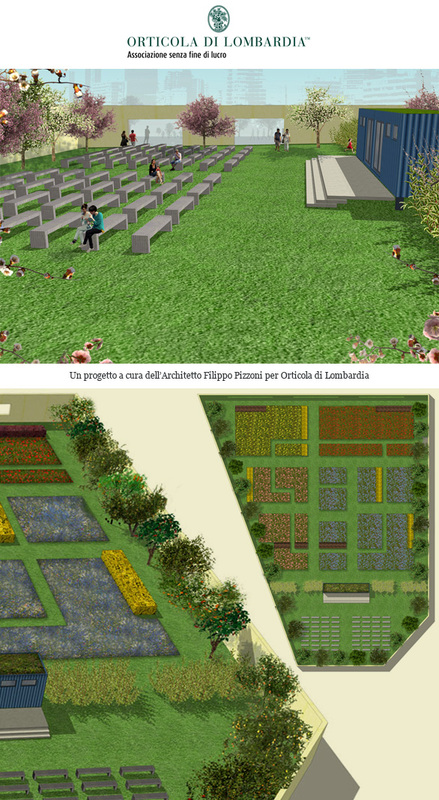 Devised by Filippo Pizzoni with the help and plants of Susanna Magistretti from Cascina Bollate, it is a garden which invites the discovery, not only of traditional flowers and vegetables, but also particular cultivations, including the new introductions of the Dahlia Garden, Vegetables from the Otherworld and Sun Flowers in 2018. 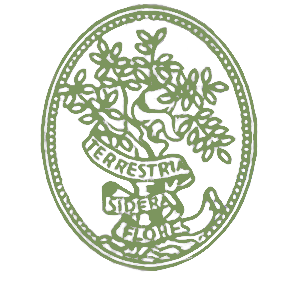 Orticola continues its mission to promote knowledge and Italian horticultural and gardening traditions, never forgetting beauty, in the Flowering Allotments, a gift to the city of which Orticola is justly proud. Partnership agreed with CityLife — The collaboration with Orticola, following a project by the architect Filippo Pizzoni, for the Lombard Horticultural Society, is based on the creation and transformation of a vast area with spacious Flowering Lots, which attracts walkers into a wide flower meadow like a vast maze, planted with different mixtures of herbaceous perennials and annuals, chosen from the more ornamental species of the European flatland flora, to a great vegetable garden and a herb garden. 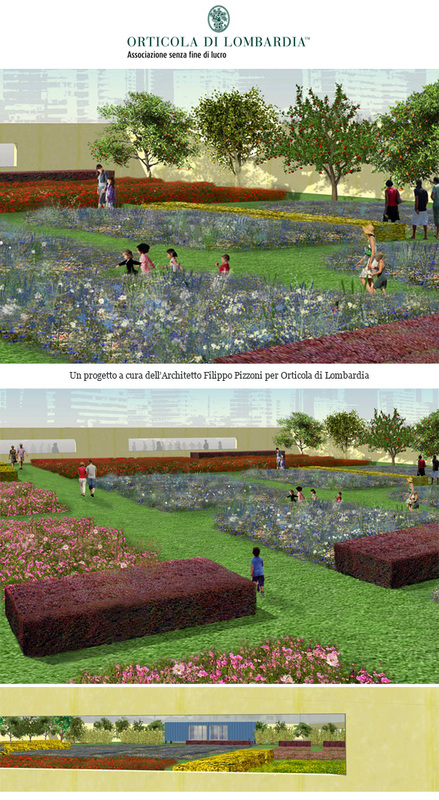 The flowering meadow is in tune with the research that Orticola is conducting into the study of different, innovative proposals for cultivation in the city with low environmental impact, with the scope of reducing maintenance costs, without spoiling the aesthetic quality but rather trying to improve it. This research fits in with the experimental viewpoint of Urban Horticulture, already begun by Orticola with the Flowering Vegetable Gardens at Palazzo Dugnani in 2011, where the 5 flower beds around the fountain were planted as ornamental vegetable gardens, mixing flowers, vegetables and fruit trees, continuing with the layout of several open spaces in the city, as Orticola has always done, and which is now regulated by the Convention with Milan Municipality. This significant new partnership is agreed with CityLife, one of the biggest renewal projects in Europe, in the Fiera district of Milan, a vast area whose transformation plan involves an articulated and balanced mixture of public and private functions, with residences, offices, shops, services, open spaces and public areas, following objectives and criteria for sustainable development, reducing direct and indirect environmental impact of the activities carried out. 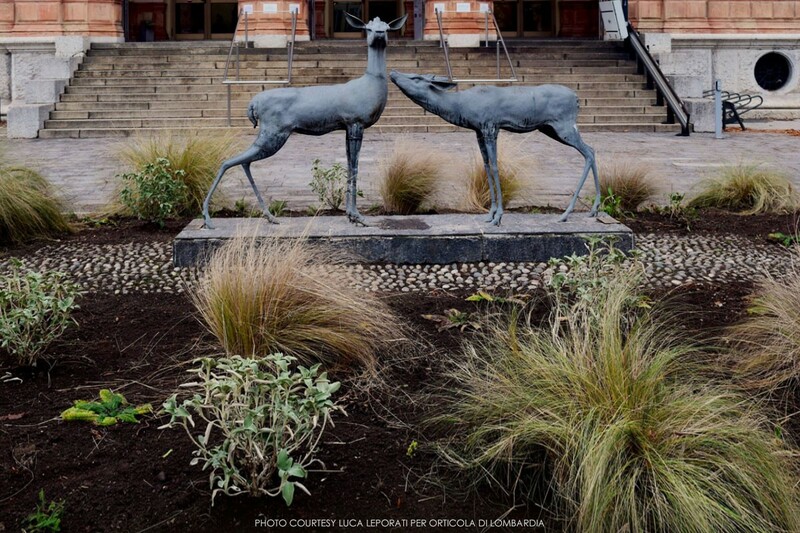 The Lombard Horticultural Society supplies street furniture as well as arranging some of the city’s flowerbeds, such as the Fawn bed in the space in front of the Natural History Museum, planted in autumn 2017. This year the reorganisation of the public information boards placed near the 12 entrances to the Indro Montanelli Public Gardens will begin. Since 2011 Orticola has placed benches in various parts of the city with the support of Ceresio Sim, including the courtyards of Palazzo Dugnani and the Modern Art Gallery, the Villa Belgiojoso Bonaparte garden, the Royal Palace Garden and in piazza Meda. This year saw the beginning of a study and experimentation programme to improve some of the city’s flowerbeds over the next three years, where Orticola intends to experiment new ways of working to try and reduce maintenance on behalf of the Administration, keep the aesthetic level of the flowerbeds high and improve the citizens’ knowledge of plants, their uses and care. The first were the flowerbeds in Piazzale Luigi Cadorna and Piazza Meda, to be followed by a series of renovating interventions through the seasons, whilst monitoring the whole process, to provide useful information to the administration for programming and maintaining the city’s plants. The innovative and sometimes experimental aspects will always be explained to the citizens and anyone interested by means of explanatory panels displayed on site, providing all the information needed on the plants used and their characteristics. The wide-ranging view from Palazzo Dugnani’s porticoes and loggias over the Public Gardens and the scene of the square around the large basin containing the fountain, have become the emblematic vision of the Orticola Show over the last 20 years. From the other side, seen from via Manin, with the entrance at number 2, the building appears as a great block facing the road. The Lombard Horticultural Society has taken on the responsibility of improving the external perimeter, opening onto the portico of the courtyard facing the gardens, bordered by the railings embracing the central body of the building behind the side wings jutting out into the park. This space, very visible behind the statue of Antonio Rosmini which dominates the steps leading down to the fountain square, returns to its former splendour with the abundance of wild flowers along the railings and the walls of the central courtyard. The project was entrusted to Marco Bay. This research fits in with the experimental viewpoint of Urban Horticulture.